Description Step back in time and take a beautiful drive to the quaint village of Schuyler, childhood home of Earl Hamner, Jr. Walton’s Mountain Museum is located in the old school and offers replicas of John-Boy’s Bedroom, Ike Godsey’s Store and other rooms, plus exhibits, and all kinds of photos and memorabilia from the Waltons TV Show. Other rooms include the Script room, Exhibit room, Recipe room and Military Museum room. Also, there's a 30 minute video featuring Earl Hamner and the Stars of the “The Waltons”. In the gift shop – locally handcrafted items, Walton’s memorabilia, books by Earl Hamner, and other local authors, pictures and DVDs of the Walton’s TV show. (Open during museum visiting hours)Playground with picnic area also available. 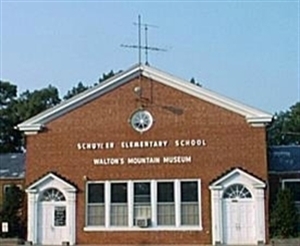 Add Walton's Mountain Museum to your free online travel itinerary.